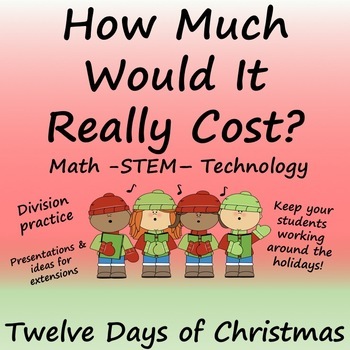 How Much Would It Really Cost is a super fun holiday lesson(s) that will keep your students actively working during those December Days! This editable resource uses 2018 data - and will be customized each year to provide current figures. Definitely can integrate technology using powerpoint or google slides. 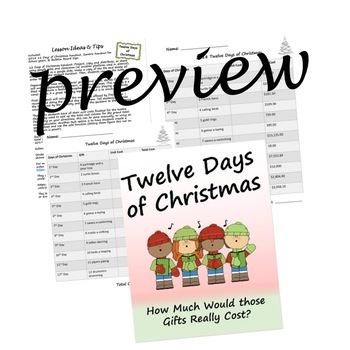 Students work backwards to calculate unit costs and figure out the total costs of the gifts we sing about in The Twelve Days of Christmas. Also included are ideas for enrichment and extension if you have more time, and a bulletin board sign to showcase their work. Your students will get division practice (up to 12 as dividend). Perfect for those days when you don't want to appear as a grinch, and want them to stay focused and engaged - and continue learning! Enjoy your holidays and remember to update each year for the current prices! No prep needed - hands-on learning! Did you know that you can receive credit toward future TPT purchases by reviewing this product? If you enjoyed these resources, please take a moment to leave a review.